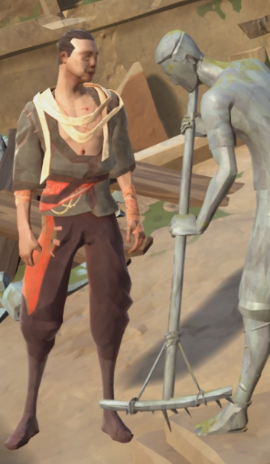 Statue Man is an NPC in Absolver. He is responsible for setting up the statues around the Oratian Quarter. He is also the NPC who allows you to create Schools. "This is the first time we meet... I always remember Prospects, even under their masks. If you have built an interesting Combat Deck, you should create a school out of it, and share your wisdom. Now is too early though... Progress in Combat Trials first. Come back to me when you are ready, and I'll show you about how to become a mentor. I'll be working on my statues until then..."
Passive NPC. Not able to be hit and will not attack you.